The former Spain international met with Blaugrana president Sandro Rosell and sporting director Andoni Zubizarreta on Thursday, and informed the pair of his desire to take a sabbatical from the game after four years at the helm of the Catalan giants. Guardiola, who has led Barca to 13 titles since taking charge in the summer of 2008, is expected to confirm his departure to his players at a team meeting on Friday morning, and it is then believed he will address the media alongside Rosell at a press conference after a scheduled training session later that same day. Consequently, the club have set their sights on luring Athletic Bilbao boss Bielsa to Camp Nou. The Argentine is out of contract in the summer and has the unanimous backing of the Blaugrana board, as well as that of Guardiola, who considers Bielsa the best coach in the game today. 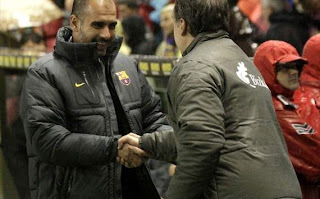 Indeed, it is thought that Guardiola may even be asked to attempt to persuade Bielsa to make the move to Catalunya. Should the 56-year-old Rosario native decide to remain at San Mames, Barcelona will then seek to appoint someone from within Guardiola's inner circle, namely assistant Tito Vilanova, former B team boss Luis Enrique, who is currently in charge of Roma, or even ex-youth team coach Oscar Garcia. Failing that, Barca could turn to former Villarreal coach Ernesto Valverde, or a foreign alternative, such as Germany's Joachim Low. However, the club's directors do not believe it will come to that as they are confident of landing Bielsa, their prime candidate for the position.